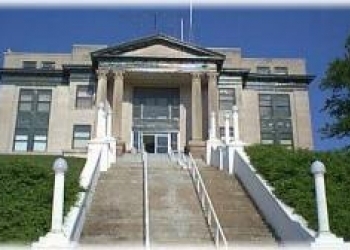 The Board of Osage County Commissioners met Monday morning for a regular scheduled meeting at the courthouse in Pawhuska. A couple came to the meeting from the city of McCord complaining about water drainage from the Osage Casino landing in their yard. As a result, they haven't been able to put out a garden in seven years. District One Commissioner Randall Jones says before the casino was built, that was farm land. He said problems existed, but they were fixed much easier. As part of an ongoing project, there are three telephone poles that need to be moved, but the County Commissioners have no control over how or when this occurs. District Three Commissioner Darren McKinney, Commissioners Assistant Kandy Jump and Jones explain. The Commissioners gave more than $7,000 to the Osage County Tourism Department to update their brochure and make 40,000 more copies. The Tourism Department also got $2,500 to fund the Ben Johnson Memorial Steer Roping Event and $2,500 to fund the Buddy Hartness Memorial Steer Roping Event. The EMS Advisory Board met for a regular scheduled meeting last week in Hominy and they will meet again on Thursday, April 25. During citizen's input, Sheriff Eddie Virden alerted the commissioners that his department is having some vehicle issues. Several cars have more than 250,000 miles on them. One needs a new motor and another was recently struck by a deer. The next regular scheduled Osage Board of County Commissioners meeting is scheduled for next Monday at 10 in the morning.